Day 2 of Colour Contrasts for the Digital Dozen and I'm pretty happy with the colours and how they pop in this mani. I'm not sure if they technically are considered contrasting colours, but the combo of the neon and then then black trees just makes it all some glaring and contrasting to me. 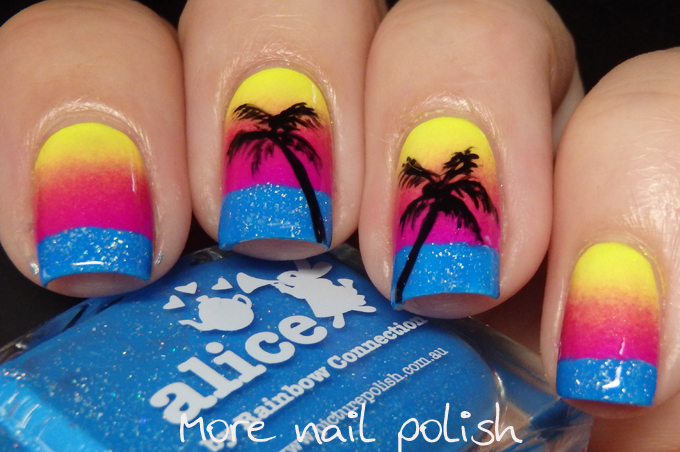 I used two Pipedream Polishes from the ANIVC again for the yellow and pink gradient. 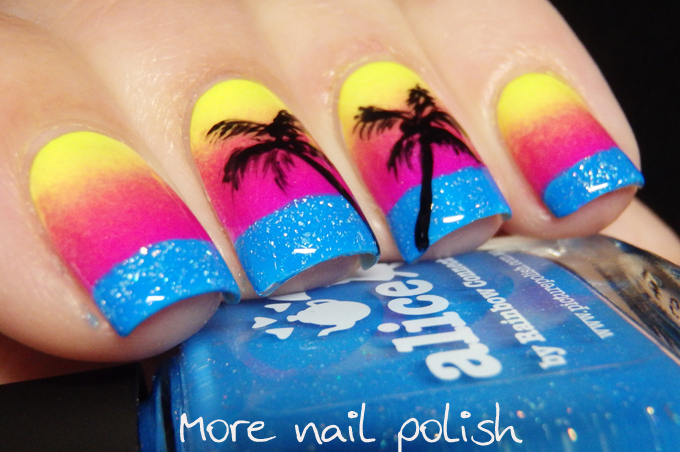 The blue is Picture Polish Alice. I love that this polish has the scattered holo bits in it cause it looks like light reflecting off the water, whereas the pink and yellow in the sky are cremes. I was going to stamp the palm trees, but I wasn't able to find the right angle trees looking through my plates, so I did some free hand. I have to say that free handing palm trees is pretty damn simple and I think anyone could do it. Thanks for stopping by. I have at least one more mani done, but not sure if I'll get all five completed. These look awesome!! The colors are so fun! LOVE LOVE LOVE!!! 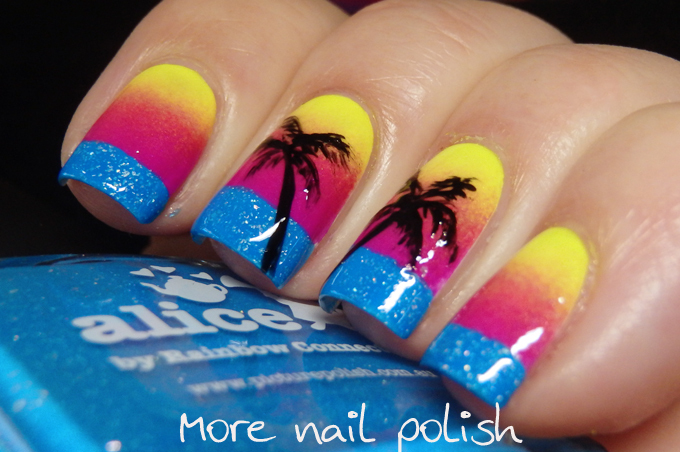 Seriously, the gradation, the palm trees, and the glistening water! Ahhhh makes me want to be at the beach! Ah SO need a beach day, or ya know maybe a month! Hehe!! 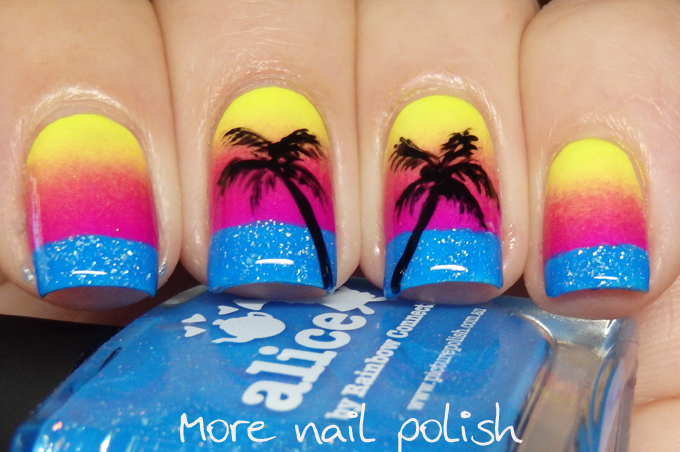 That polish you used for the ocean is just FABulous! I now need to go on vacation! :) I love this and they are perfect!